Shore armor - the construction of bulkheads and seawalls - has become a significant environmental issue in the Puget Sound region. Years of scientific study has led to the determination that hard armor profoundly influences coastal processes, alters coastal ecology, and reduces the resilience of the coast to rising sea level. Many alternatives to hard armor exist for managing risk to structures and infrastructure posed by coastal erosion, including: the use of best management practices, structure relocation, and implementation of "soft shore protection" project designs. Successful soft shore protection project designs must be informed by a thorough understanding of specific site conditions and work within the range of current and historical coastal processes. Science and engineering principals are combined to develop and monitor designs. 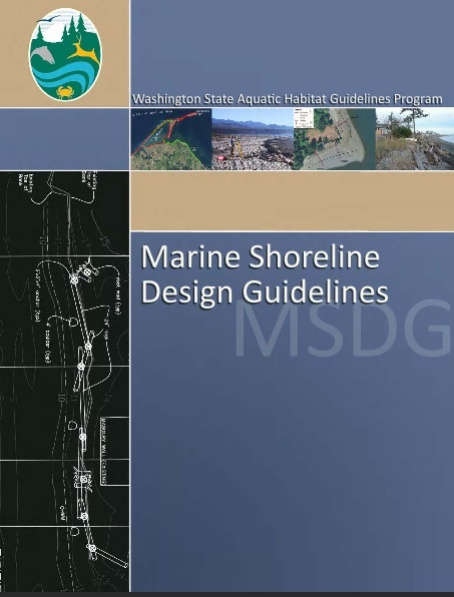 The Marine Shoreline Design Guidelines (MSDG) were developed to provide a comprehensive framework for site assessment and alternatives analysis to determine the need for shore protection and identify the technique that best suits the conditions at a given site. There are many guidelines and manuals for the design of 'protection' techniques for the more typical open coast, but prior to the MSDG, there was almost no guidance that reflected the variety of conditions found in Puget Sound. For this reason the MSDG were created to inform responsible management of Puget Sound shores for the benefit of landowners and our shared natural resources. Chapters 1 and 2 provide background information which includes the geology of Puget Sound, the documented impacts of armor, and responsible shore stewardship. Chapters 3, 4, and 5 provide a framework for conducting site and coastal processes assessments that inform an alternatives analysis resulting in the selection of appropriate management techniques for a particular site. Chapter 6 and 7 contain descriptions, project examples, and design guidance for specific design techniques based on past project performance. Chapters 8 and 9 discuss monitoring methods for shore projects and identify future research needs. Appendix A provides the results of the case study assessment in which 25 existing erosion control projects in the Puget Sound region were evaluated for their (relative) success with regard to impacts and benefits. Appendix B provides a literature review of additional references on coastal processes and shore protection for the technically inclined. Johannessen, J., A. MacLennan, A. Blue, J. Waggoner, S. Williams, W. Gerstel, R. Barnard, R. Carman, and H. Shipman, 2014. Marine Shoreline Design Guidelines. Washington Department of Fish and Wildlife, Olympia, Washington.